Elijah Wood (‘The Lord of the Rings‘) lends his voice to the mini-series again along with Melanie Lynskey (‘Sweet Home Alabama‘) and Collin Dean (‘Hotel Transylvania‘). ‘Tome of the Unknown’ tells the story of two brothers, Wirt (Wood) and Greg (Dean), find themselves lost in a mysterious place called the Unknown; a place where long-forgottenstories take shape around them as they search for a way home. Tired of walking, they decide to borrow a car from a romantic songster made of vegetables and head off to the big city. Aiding their journey are a wisened woodsman and a bluebird named Beatrice (Lynskey). 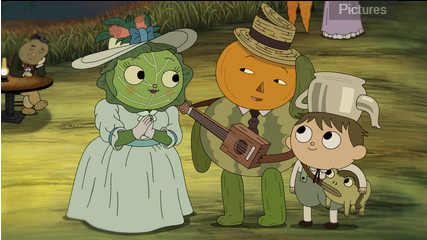 ‘Over The Garden Wall‘ was created by Pat McHale, she also worked on Cartoon Net’s ‘Adventure Time‘. This entry was posted on Monday, March 10th, 2014 at 10:12 am	and is filed under News, Television. You can follow any responses to this entry through the RSS 2.0 feed. You can skip to the end and leave a response. Pinging is currently not allowed. « Uma Thurman Joins Kristen Stewart and Jesse Eisenberg in ‘America Ultra’!! !